The raison d’être for pairing these two rather dissimilar works is that Tchaikovsky received a commission from the Imperial Mariinsky Theatre for a double-bill, which he ultimately filled with Iolanta and The Nutcracker, their premières coming on December 18, 1892. The production here by Dmitri Tcherniakov, who created a new libretto for The Nutcracker, has received high praise from many critics, though not quite everyone was pleased. Iolanta tells the story of a blind girl, the daughter of a King, who in the end gains her sight because of her love for a knight (Vaudémont). It’s a touching if simple sort of fairy tale-like story and Tchaikovsky’s music is charming and quite masterly. When the opera ends, and you expect the singers to take curtain calls, Sonya Yoncheva (Iolanta) halts the applause and the The Nutcracker begins promptly. Now, as the main characters and guests come into view cheering, you realize that the performance of the opera was a staged event put on as a birthday present for the ballet’s lead, the young Marie (Clara, in some productions). You also soon realize that characters in the opera have a counterpart in the ballet, Marie being Iolanta’s. Actually, Marion Barbeau as Marie does appear briefly in the opera as does Sonya Yoncheva in the ballet. Judging by clothing and furniture styles, both Iolanta and The Nutcracker are updated to the mid-20th century. As The Nutcracker story unfolds we see Marie being treated to a grand party filled with fun, games and dancing. Eventually Marie’s family and the guests leave and Marie is left alone. She meets Vaudémont and they kiss, but suddenly the family members and guests return, radically changed though, as if under hypnotic control. Marie’s mother begins casting spells and soon the house is destroyed in an explosion from a meteorite strike. Marie finds a nearly lifeless Vaudémont in a dark, post-apocalyptic world, where they dance before he falls dead. After further nightmarish trials Marie reaches the Kingdom of the Sweets where there are outsized dolls and dancers appearing as her look-alikes. After braving more frightening places and events, like the ghostly reappearance of Vaudémont, Marie awakens in her house, the whole horror having merely been a nightmare! What a twist! No one ever saw that coming! I couldn’t help but see the Wizard of Oz in this story: young Marie taken to a strange and far-off world; characters in one setting turning up in another; Marie’s mother transforming into a sort of Wicked Witch of the West; the whole nightmarish second half of the ballet being just a bad dream. Yet, while this libretto has its weaknesses and predictable plot developments, it is fascinating in many ways. 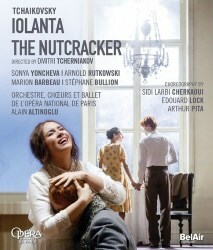 It’s not a sugarplum version of The Nutcracker for children, but a rather unsettling and at times quite imaginative takeoff on it that features a clever parallel to the opera: to fulfill her love of Vaudémont Iolanta has to overcome fear to conquer her blindness, and Marie must also learn to defeat fear in confronting the ghastly happenings in the latter half of the ballet. Moreover, while you might think Tchaikovsky’s mostly chipper music would seem out of place in this dark story, it fits in quite well, sometimes with a cruel sense of irony, as exotic or playfully innocent music can seem to be poking fun during moments of emotional lows. And the special effects are excellent too: in the forest sequence the video projections of birds in flight, large animals moving about, scenery streaming across the floor, and the background of a netherworld in dark woods are most effective in creating a spooky, menacing atmosphere. In addition, the seamless transition from the opera to the ballet is a brilliant stroke. Thus, the production has many merits and because the ballet is wedded to an excellent version of the opera, the whole package is quite fine after all. Indeed, not least because the performances in both the opera and ballet are splendid. Sonya Yoncheva, despite a supposed indisposition, sings beautifully and is dramatically convincing as well. The rest of the cast in the opera is quite fine, though Elena Zaremba’s mezzo voice has thickened somewhat over the years and has lost a bit of its lustre. The dancers in the ballet, led by Marion Barbeau, are also very impressive, despite middling choreography in some of the sequences, as fashioned by two of the three choreographers noted in the heading. Marie’s birthday party, choreographed by Arthur Pita, is somewhat of a disappointment. The opening of presents by Marie and the game played with guests switching chairs are both uninteresting and unimaginative, hardly balletic in any classic sense. The Kingdom of the Sweets segment also exhibits some dull choreography by Edouard Lock: those big dolls move around with about the elegance and sophistication of sleepy elephants. But then, posed with the vexing task of giving those oversized toys some kind of interesting animation, few choreographers would likely do much better. Despite these episodes though, the choreography is overall reasonably good. Alain Altinoglu conducts both works with a natural grasp on Tchaikovsky’s unique expressive character, effectively capturing the music’s vivid colours, its plentiful lyricism, its emotional highs and lows, and its masterly sense of drama. In the process he coaxes out excellent performances from the Paris Opera Orchestra and gets fine singing from the chorus. As for the competition, there is a very fine Iolanta paired, oddly, with Stravinsky’s Perséphone on Teatro Real Blu-ray and DVD, but it features a sort of minimalist production approach with barren sets and mostly dim lighting that likely won’t appeal to a broad audience. There are very good video versions of The Nutcracker: Gergiev/Mariinsky on Warner Classics, Pavel Klinichev/Bolshoi on BelAir Classiques and Ermanno Florio/Dutch National Ballet on Arthaus Musik. All of these feature more traditional productions of the ballet, with the Gergiev effort the best. But these offer The Nutcracker with no other work on the disc, though the Florio is in a three-disc box with The Sleeping Beauty and Swan Lake. So, this new BelAir Classiques Blu-ray is the only way to get both Iolanta and The Nutcracker on one disc (two in DVD format). The sound reproduction, camera work and picture clarity are excellent on this Blu-ray disc. In addition, there is an interesting, nearly one-hour bonus feature that contains rehearsal scenes and interviews with stage director Dmitri Tcherniakov, conductor Alain Altinoglu, Sonya Yoncheva, Marion Barbeau and others involved in the performances. In the end, there are far more pluses than minuses here: you can say the opera is a great success, the ballet a bit controversial but quite intriguing and definitely a bold approach to a classic. Subtitles: English, French, German, Spanish, Korean, Japanese. Booklet notes: English, French, German.